February 23, 2012: I Want YOU to WANT me! Pledge and show your love! I second that Cash never gets old ; ) , havent hear this tune in a while! good morning everyone!! Pledge NOW!!! I knew I recognized Elliott from thirtySomething's electronic violin playing! Currently up for grabs is listener Marika of Estonia's mixtape with Herbie Hancock, Spacemen 3, Les Baxter, The Avengers and lots more! Er, pardon my ignorance, but how do we bid? Call 800-989-9368, or click the blue PLEDGE button up at the top center near the cow and the dog. This comment board is MINE, ALL MINE! MWAH HA HA HA HA!!!!! NO calling.... just web pledges only..... But thanks Kenzo! @ Dave B : is that the sound of an adoption i hear ? Robin - i think you need to pledge during the segment when Meghan announces what's up for grabs. @Pierre - you got that right! Robin - your pledge amount is your bid. The person who pledges the most during Meghan's two Marathon shows - this week and next week - gets to pick the next the theme for the March 8th edition of Underwater Theme Park (first week after the fund drive ends). Thanks Guys! Am hopefully now in the running! Oh, by the way, my mixtape DID turn up eventually, didn't it, Meghan? We've been doing the annual pledge drive at Resonance too, so I've been rather busy with that and forgot to check back! Hope you got it! 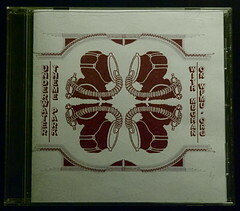 Any pledge is eligible for the prize cds that are given away during the course of the show. Currently Marika's mix cd is up for grabs and we have only five people in the running - we'd love to hear from more of you! But there are also 'premiums' which you receive automatically based on how much you pledge: $15 for a bumper sticker, $50 you get the sticker plus a t shirt, $75 adds on Meghan's cd to that, 180 adds on an FMU bag and you can request two DJ cds in addition to Meghans, 365 in addition to everything else you get 7 dj cds, an LP slipmat and the WFMU Jersey City postcard flexi-disc - truly unique FMU-only swag! I DID get it Robin!!! Hurrah!!!! And phew! And hurrah again! MC Rob - The mouse got the best of me! One more thing - we do have one "grand prize" - Yo La Tengo's "underwater" DVD - and to be in the running for that you need to pledge $75 or more. Of course at that level you automatically get Meghan's cd. Okay, why the heck am I so nervous now? Congrats Robin! You played the game and WON and so did we!! Congratulations to Robin, winner of listener Marika's mix CD. The next prize up for grabs is listener Caryn from Finland's mixtape featuring Midge Ure, Charles Aznavour, David Bowie, Badding Somerjoki, Dionne Warwick and lots more! Don't be nervous Caryn! I'm just glad the dying cat screeches of the tape deck seem not to have affected the sound quality, so whew! Okay dear listener, get in the running for listener Caryn's cassette "It's All Relative", lovingly prepared and sent to us all the way from Finland! Pledge now using the woof-moo box at the top of this page. Thanks! Just put my two cents in, on the way to a mouse plus. Good morning and thanks Maestroso! Well, if you pledged by phone since 6 am you may find that you've won a Schlock Rock cd - ! Or maybe not. But yes, online pledges only from now to 9 am NJ time - just pledge using the woof-moo box right here on the Underwater Theme Park playlist page, thanks! One more mouse (dollar-a-week) pledge gets us to a nice round figure for the first hour of Meghan's show! Could you be the one to put us over the top? BTW; Meghan, looooved the Allan Sherman and Ann-Margret tracks! This is good too. In other words: you're in excellent form this morning. No cassette player, Meghan?! I have three! Want to borrow one? I need Evil Brady's mini-disc mix tape! @Evil Brady: I still have a couple of portable minidisc players that I used to use for portable music before I had an iPod and before I had a Zoom H4 for bootlegging. I have two Minidisc players as well. But one of them is a bit rubbish. Our prize cd up for grabs now - TP Poly Rhythmo CD! Don't feel too bad, Meghan, I spent ages cueing up a seven inch on our pledge drive on Sat and then played the B-Side! An unbelievably schoolboy error! I love Pocket-CDs... Well, I collected two Husker Du tiny CD singles. hey do I have to keep donating to try to win these mix CDs or does my mega pledge earlier put me in the running? You are welcome Meghan, i really love your show. Wet Croissants > french songs for every occasions. 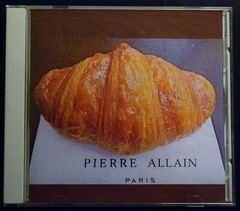 Also up for grabs now is Pierre's amazing Wet Croissant for Breakfast cd! Featuring Ludwig von 88, Francis Bay, The Kids, Jacques Tati (!) and lots more! that croissant looks nice and crunchy! Dave B - yes, the way it works for the prize drawings is that you would need to pledge again ($15 or more) to be in the running for a prize. However you already qualify to be in the running for the Grand Prize Yo La Tengo DVD which we will draw for at the end of the show. And you also will get a slew of premiums automatically based on your pledge total so far. @pierre: yeah, hearing your creation on a radio station you adore, in front of people whose taste you look up to... Aargh! I like the "We croissant for breakfast" version of the title on the playlist. I'd love to say that to someone: "Oh, we croissant for breakfast." And thanks for collecting tickets at the Park! 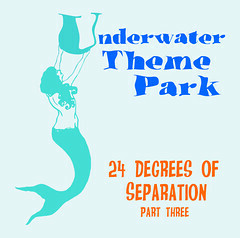 Correction - top total in the race to choose the March 8 Underwater Theme Park theme is now 380 clams! "I HAVE NOT YET BEGUN TO PLEDGE!" Meghan, you rock my world every Thursday at noon time. Do I have Yo La Tengo's underwater DVD already? Science Is Fiction/The Sounds of Science? ...but any pledge is great, and right now just a couple of people in the running for two prizes - TP Polyrhythmo cd and Pierre's fabulous French mixed cd. So make a pledge, get in the running - your odds of winning are excellent - and support this nutty radio station and Meghan's great show! Elwyn..... I am not sure if you do, but if you don't..... you better get in the running!!! Yair! Thank you! You are too sweet! Hey Marika of Estonia makes some good stuff ! Yay! That Yo La Tengo DVD, I do have, and it's fantastic. 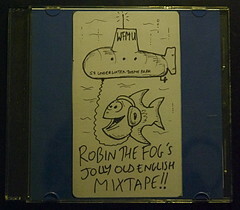 Pierre's cd is still up for grabs as a prize - and we've added Robin's Jolly Old English Mixtape - featuring Noonday Underground, DJ Food, Cobra Killer, YMCK and lots more! Well Robyn, i'm ready, althought i really love the U.K. and your mixtape seems great. So after the BATTLE, we shall all join in a communion of love of music. I SHALL BY A PINT (or any other drinks, or a bottle, or some cheese) TO THE WINNER ANYTIME HE PASS BY PARIS ! That's it people another reason to pledge. Oh I want that prize Pierre! I want it too!! Just bid for tape and pint combo! @Meghan : FMU djs doesn't have to win this. Anytime you come in here, it'll be an honor for me. Yes! i'm in the race too! @Fred Von Helsing - I second that. Wow, Robin. Our mix tape compiling habits are shockingly similar! It's 6 minutes to midnight... I'm too sober! good morning. i cant call to pledge? How does the pledge system work? I need to pledge a mouse to get the Shut Up Weirdo t-shirt. Come on, listeners! Max Tundra, Cobra Killer, YMCK, Ken Nordine, The Slits, Bruce Haack, DJ Food... What more could you ask for? And I compiled it NAKED! While at WORK!!!! Bid for it! Pierre, Caryn, everybody how are you. Meghan's Boston Rocks cd and Robin's Jolly Old England cd are still up for grabs and the odds are good - make a pledge and help us bust past the halfway mark to Meghan's goal! So Meghan doesnt get one phone line? It's time consuming to pledge on web. Meghan's Boston Rocks cd includes Boston icons like Jonathan Richman, the Lyres, Mission of Burma, Big Dipper (as you just heard) and lots more! @KP : hi, it's great over here, feels awesome to share, pledge, and love. Pierre.... she was my co-host a couple times and her comments board name is Messica! KP - logistical thing here at FMU - we can't take phone pledges during the web-only period from 6-9 am NJ time. That's because we have only one phone system for receiving pledges and that's used by the Jewish show that is broadcast on 91.1 fm during those hours. Oh man, I was in the car and it sounded like I missed out on some great mix tapes. Well, I've got a pledge on the way soon! What was the theme of it on this theme show? How about you give the number of Meghan's iPhone? @ Meghan : allright, well i hope she'll enjoy wet croissants, and that drink, i'm looking forward to meet her on the comment board and do a proper invitation for that pint. A croissant! Pierre That looks nice. What are you an artist or something? I just finished moving. Hafta sort out my pledge situation (and money situation). How much longer does the pledge drive go? Ken was in studio jus a few hours ago tryng to cop prizes on Faye's surprise show. Then i slept two hours now im here. Moving IS the ultimate excuse. A nightmare. Who got it? Sorry I missed it. Will happily stand the winner a pint as well! 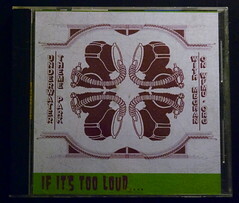 Newly up for grabs - listener Jeff's cathartic It's Too Loud metal mix cd with lots of web-only curse words! 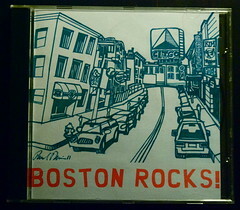 Still up for grabs - Meghan's seminal Boston Rocks cd! I love Jolly old England! Not as much Enviable Erin maybe. "My hangover breath is so vile, it pretty much deserves naming rights to a NJ rest stop." Okay, we've hit 50 pct - but if you haven't pledged yet (or perhaps want to up your pledge and get in the running for a new prize) can you help us reach our goal with just over a half hour left? Thanks! I am almost done with show number 1.... i should be WAY past 50% damn it! come on everyone! DO IT NOW!!!! And if my winner ever comes over here to the Arctic Circle, I'll happily buy her a warming or cooling drink, depending on the weather. Top pledge total for Meghan's marathon show(s) is now up to $395 - remember, highest pledger for the two weeks gets to choose the theme for her March 8 show! William of Northport, I'll address you directly. Come to London. I will buy you a pint. And I promise to wear clothes. Fred, that is an amazing theme! 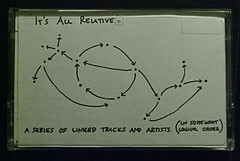 Actually Dave Mandl, FMU veteran DJ would be a great advisor for a Situationist theme show Meghan. I'm not kidding. Fred, save your pennies and go for it! I've kinda given up on the Rush show ever materializing. @maestroso: okay, thanks for the info. The offer, like the song, remains the same. Bill Sweeney's mix cd now added to the prize pile! fvh, save your pledge until next week's show to get an idea of the competition and how much you need to pledge to win. Then swoop in at the last minute with a bigger pledge and win! @Fred V - should we try to get "The Situation" in for a guest DJ spot? This is the End! Dont include me in my own drawing! "He's upped his pledge. Now up yours!" "The Situation" ?? some US kulchur thang ? Fred - or lack there of. THanks FVH. That is inspirational! @Dave B: only if the idea is to lure him into a trap, tie him to that damn crucifix at the station, and leave him there to never blight our tv screens again! boston rocks is just as good! I thought J-Wow was going to guest host for Meghan. Caryn, what was your CD theme? I wonder if any of the live Doors is from their Flushing Meadows Park concert? So you do have a Boston accent! I have that but the quality is terrible. This has the End at Waterbury High School 1967. 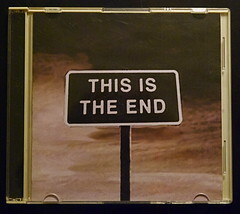 Two long versions of the End, actually. 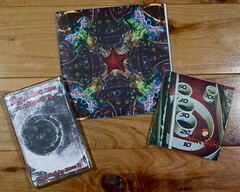 Dave B's three format Mix - cd, baby cd and cassette - now up for grabs! 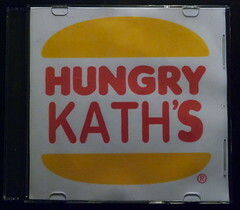 Along with Jeff's metal mix cd and Hungry Kath's 3 cd mix! Forget "Where's the beef? ", where's the pledge? Isn't it nearly time for the show to end? If so, thank you Meghan and Rob! What a splendid show and how pride I am to have been part of it! Great show, Meghan! Looking forward to next week already. Dave thanks. Wait this goes on next week too?